The American Fighter Rich Franklin UFC 126 Walkout Tee is here! If you’re a fan of expert striker Rich Franklin, then this shirt is for you! Franklin was and is one of the best strikers of the past decade, and he will always be an icon by UFC standards. He’s set to fight Forrest Griffin at UFC 126; surely this will be a great fight to watch. This is the Rich Franklin UFC 126 Official Walkout T-Shirt. 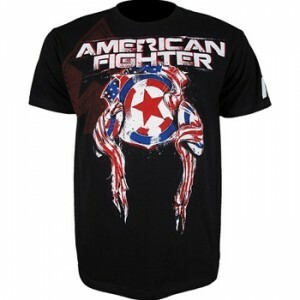 The American Fighter Rich Franklin UFC 126 Walkout T-Shirt is available at MMAWarehouse for $28.99.